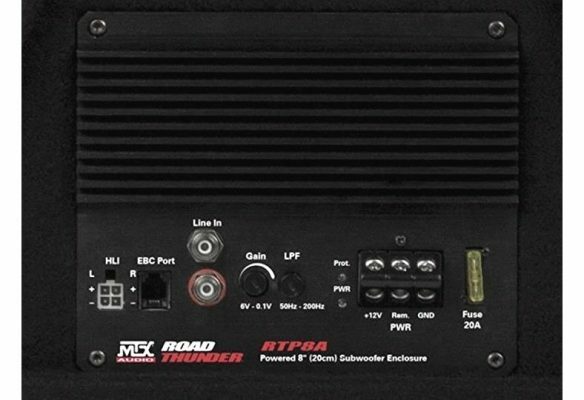 Car powered subwoofers solve a great number of problems for many vehicle applications. In this post I’ll explain the details of them, pros and cons, and finally I have a list of 5 great choices I recommend for you (see at the end below). Not everyone needs (or wants) a more permanent amp + speaker box installation. Additionally, they offer a compact and tidy way to add good bass sound in a limited space in many cars, trucks, jeeps, and more. Read on to learn and see my top recommended models! Many vehicles over the years (even as far back as the 1980s) have had factory-installed powered woofers in their premium level sound system. Typically this was because of the extremely limited space in some of the smaller vehicles produced over the years. Unfortunately while those provided a bass “boost”, they were low-power and low-volume bass devices. Many would begin to distort quickly under higher volume. You’re no longer stuck with using a cylindrical powered speaker tube like the Bazooka brand that was once popular. Additionally, new speaker and amplifier technology has made it possible to get far better sound in a very compact size than ever before! Car powered bass tubes like this one used to be one of the few options available for customers wanted better bass sound with limited room in their vehicle. Expensive custom-made speaker boxes were the other alternative. Fortunately today we have much better choices! When given a choice between different sizes of subwoofers, buy the largest you can one if you have the available space and money. Large subs can produce more volume and bass, so why not get the most you can? Car powered subwoofers are more specialized than standard mix-and-match aftermarket subwoofers, amps, and boxes. The most critical difference is that in order to produce bass in a small space, these are carefully designed to match a subwoofer to the speaker enclosure. In other words the subwoofer is carefully matched to the small enclosure it will be used in. Each type of speaker has a set of particular parameters that allow a designer to determine how it will perform acoustically in different sizes and types of speaker enclosures. These are called Thiele-Small parameters. I’ve used them frequently in custom speaker projects of my own – they’re extremely valuable to avoid “guessing” if a speaker will perform well in a certain size box or not. A reduced-size, reduced power amplifier designed just for the product is built into the design and this reduces cost as well (since you won’t normally need extra channels of sound or extra features, for example). 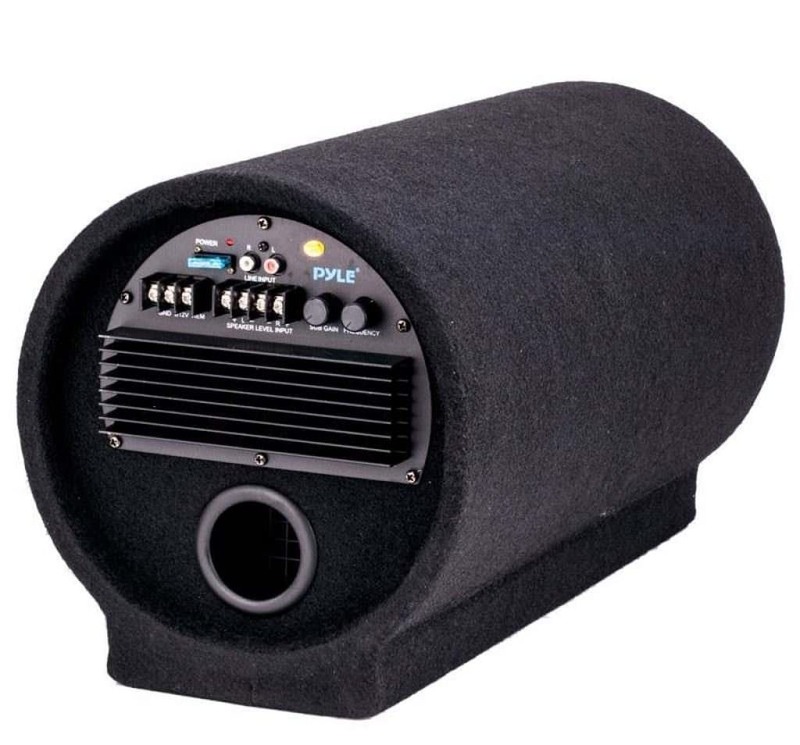 More often than not a car powered subwoofer is designed to be very modular and can be installed as a single piece of equipment aside from an option like a wired remote knob. 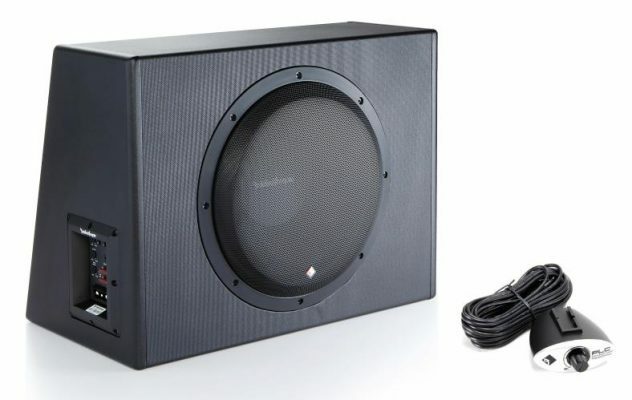 When a powered speaker is installed, connections are made to get an input audio signal which is amplified and used to drive the subwoofer for bass sound. 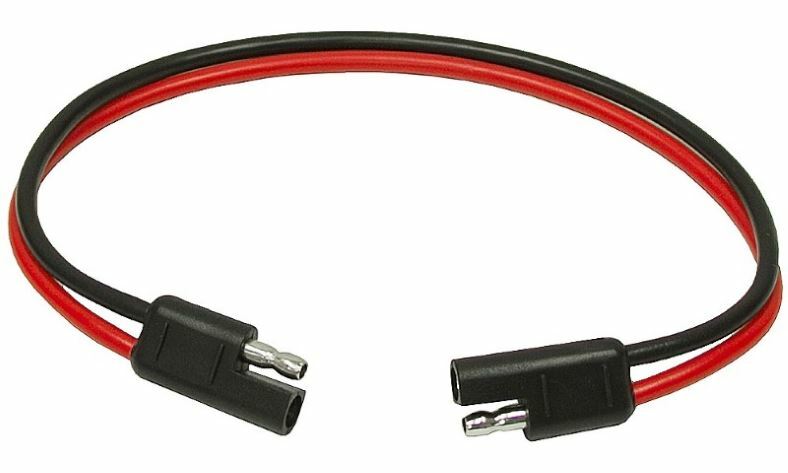 Normally this is supplied with RCA type connections (low-level signals) available from aftermarket stereos or speaker to RCA adapters, or the signal can be derived from pre-existing speaker wiring. This is called speaker-level or “high level” inputs because of the voltage required to drive a speaker. From there the signal is amplifier, high frequency sounds are filtered out and blocked, and the subwoofer produces only low, clean bass. Other options sometimes exist like bass boost and adjustable bass volume controls. Note – some powered subwoofers also contain additional speaker channels and can power a complete car audio system if desired. Close up view of the side of a powered subwoofer. 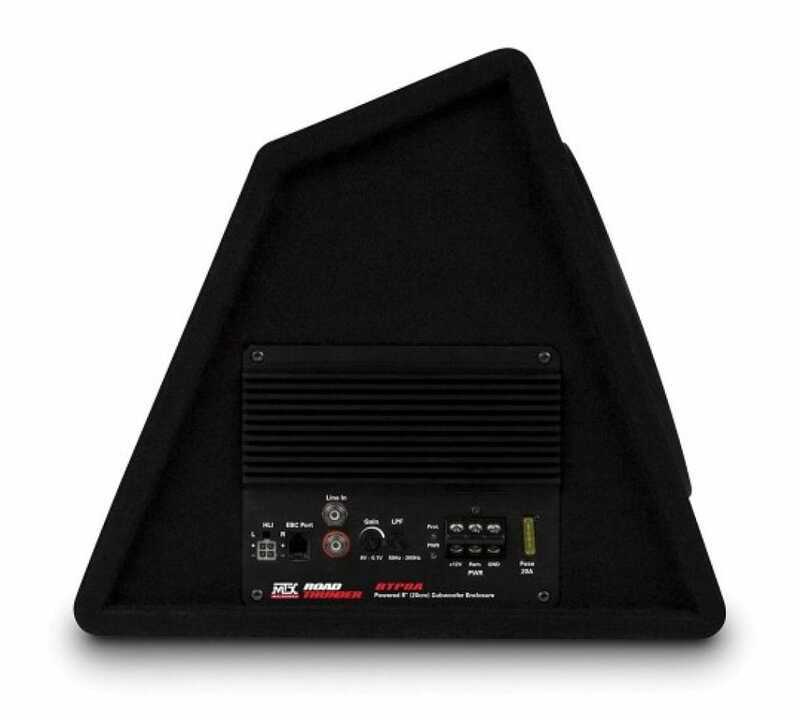 This example (Rockford Fosgate P300-12) has various audio controls for tailoring the bass sound that works best once installed. A bass boost is included to improve the bass response even if the original signal is lacking or has no bass controls to do so. As you probably already know, the average factory installed car stereo has poor bass. Space is very limited in vehicles like some small pickup trucks, Mazda Miatas and other sports cars, and perhaps even the family minivan! Another great benefit is that they save on installation time and effort! There’s no need to have to figure out how you’ll mount a separate amplifier and so forth. It’s not an issue! Unfortunately despite all the advantages they provide, a powered subwoofer does have unique disadvantages as well. It’s also important to have realistic expectations for how much bass and how much volume you’ll get from your system. This does vary greatly by brand and product, of course (see my reviews and recommendations below for some that perform well). When a malfunction occurs and the subwoofer is no longer working, in most cases you’ll have to repalce the whole unit. This is different from a typical amp + subwoofer system in which you can replace just one component. A sealed powered subwoofer is much more difficult to diagnose and troubleshoot if problems arise. You’re more limited in your options in terms of the amount of power and volume you can achieve. Because of their compact size, compromises have to be made for the volume and bass a powered subwoofer can provide. Of course, the better products provide great results I’m sure you’ll be happy with. Don’t expect earth-shattering bass sound like the more expensive subwoofer systems with large enclosures and super-high power amps. It’s not reasonable to expect the same level of performance. For the most part, a powered subwoofer is installed the same way as a standard car amplifier & speaker box. It requires an amplifier wiring kit and RCA cables (or small gauge wire if speaker-level inputs are used) and in some cases brackets to mount the product solidly inside of a trunk or other location. 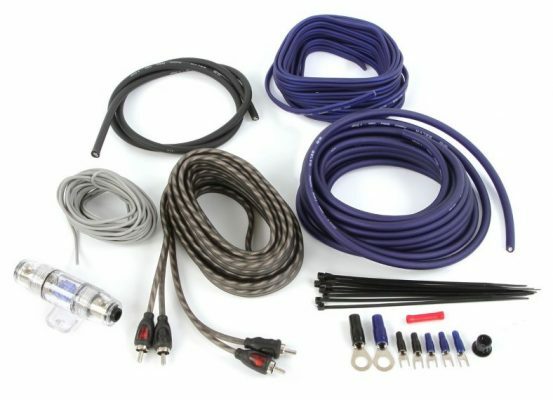 An amplifier wiring kit may still be needed – it includes the required wire and accessories needed to install a powered subwoofer. The 8 gauge kit shown above is both very affordable and a great choice. 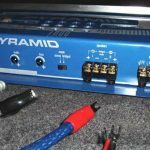 Don’t get ripped off or spend a ton of money on amp wiring for a powered subwoofer! More often than not a quality 10 gauge power wire size is fine. For a powered subwoofer with a much higher power rating 8 gauge may be fine. Don’t get talked into spending a huge amount of money on an expensive kit. If you own a Jeep or other vehicle and you’re concerned about theft you can easily remove the subwoofer. During installation be sure to use a quick disconnect like this one. I highly recommend you do so if it’s a worry for you! A quick disconnect is an inexpensive installation accessory which allows you to remove your powered subwoofer easily. I highly recommend them for people with vehicles that may be prone to theft. Jeeps, boats, and other vehicles with easily accessible areas are theft targets. 120W RMS of 8" bass power - great for trunks & SUVs! Ultra-compact design: only 13.5L x 9W x 3" D in size. Great for factory systems. 1. 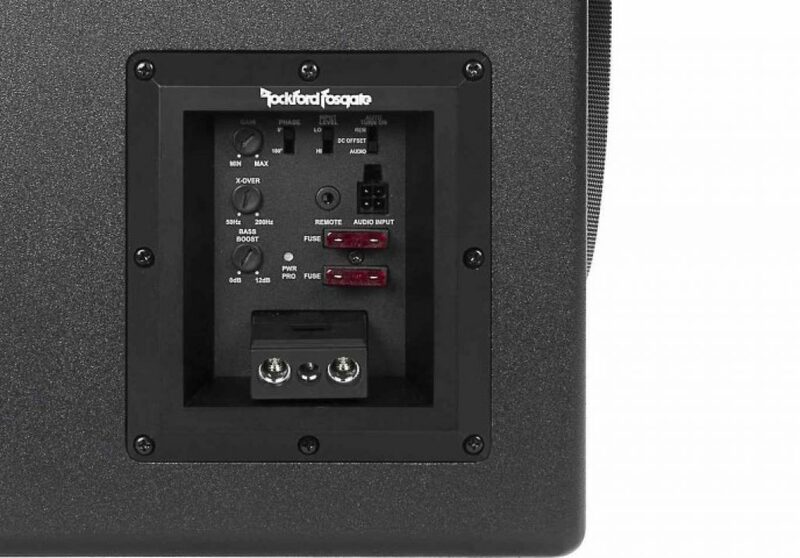 Rockford Fosgate Punch P300-12 / P300-10 – GREAT bass, excellent quality, and a great value! The P300-12 (12″ woofer) and P300-10 (10″ woofer) are both an amazing choice for many reasons if you have the space. They’re durable (featuring scuff and cut resistant vinyl covering) and they’re made from strong 5/8″ MDF material for great sonic performance and a “real” subwoofer box design. These aren’t the weak plastic subwoofers like the competitors are producing – these are the real deal. The internal Class D amplifier is nearly 90% efficient and can power the subwoofers for up to 300W with very little heat! Of course, full crossovers with adjustable frequency and a bass boost are included. Thermal and over voltage protection are built-in as well. Both RCA and speaker level inputs make installation easy. A remote bass level control is also included so you can control your bass level anytime upfront while driving. If you’re looking for high-impact, clear bass that’s reliable – and a great value too – then look no further! This is one of the best I’ve recommended yet, and one I’m happy to pass along to friends and family. Measurements are approximately 11 x 19.8 x 15 inches. Head over and check out the excellent price and fantastic reviews. People have some great feedback and feel great enjoying better bass thanks to it. 2. 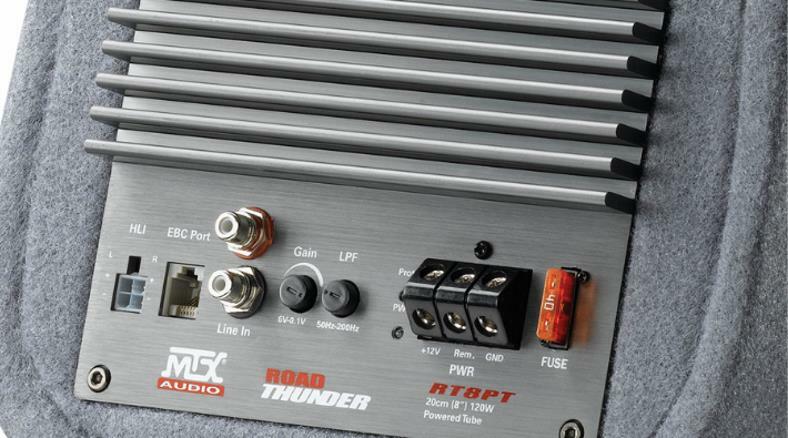 MTX Audio RT8PT – A low-profile winner and great bass in less space! 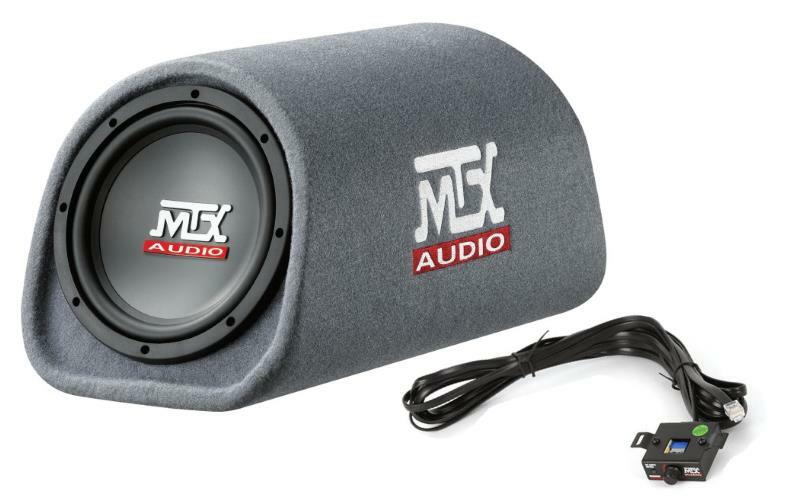 MTX has always been an innovator in American car audio technology and still to this day has an excellent reputation for reliable, well-built, and most of all, great sounding and powerful products. 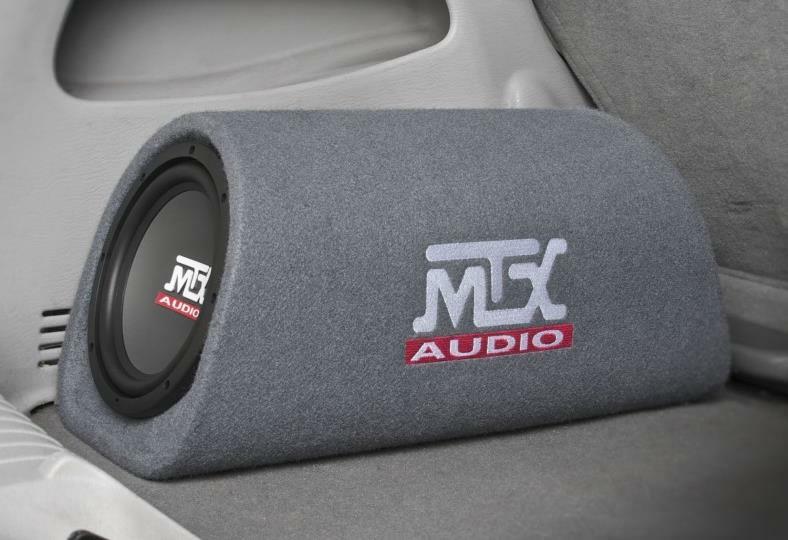 I’ve installed many MTX products over the years and I’ve always been impressed. The RT8PT is no different. Capable of delivering a true 120W of power, that means you won’t come up short on sound when it comes time to crank it up. The subwoofer is easy to install and has everything you’ll need for great sound right away. Features include high-strength RCA jacks, speaker level inputs, a remote port (remote included), adjustable gain, and adjustable low-pass crossover. The wiring terminals are really high-quality, too. Based on the classical cylindrical speaker enclosure design, it features an 8″ MTX high-output subwoofer matched to a vented tubular enclosure for great bass sound. The Class D integrated amplifier features an adjustable low pass crossover and top quality connections for power, ground, and remote lead wiring during installation. It, too, includes an External Bass Control (EBC) remote to make adjustment extremely easy to do without having to stop and open the rear of your vehicle! Installation works with any aftermarket or factory stereo system as both RCA or speaker-level inputs are possible. It has a slightly lower height than conventional subwoofer boxes as it measures 22.6 (L) x 11.2 (W) x 11 (H) inches in size. Great for the back of your SUV, many cars, and especially many trucks where rear space is limited but you want to finally enjoy real bass sound! I do recommend adding a protective grill to it, however. I’m not sure why they decided it wouldn’t have one from the factory. Definitely a good buy – great reviews and worth finding out more about now. 3. 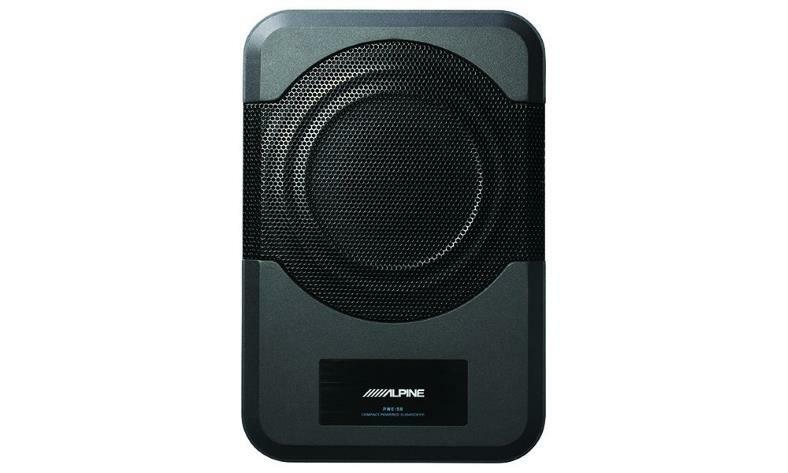 Alpine Electronics PWE-S8 8″ – One of the smallest car powered subwoofers available today! The Alpine is definitely not the least expensive product on the market, selling typically for a little above $200, but for that price you get one of the best ultra-compact self-enclosed powered subwoofers on the market. Also for your money you a real cast aluminum enclosure – a far cry from the typical low-cost plastic many others use. The PWE-S8 uses a quad voice coil speaker driver to produce additional low-end bass that compliments any system lacking low-end sound. It’s designed as a solution for extremely limited space applications like under-seat mounting, sports cars with almost no free interior space, and many, many other possibilities. 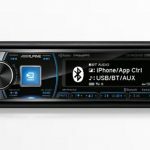 As you might expect, unlike other products on the market, Alpine’s audio engineering expertise means they’ve produced a unique design of their own rather than simply repackaging the same mediocre products like so many other brands today do. Inside is an efficient amplifier with built-in and adjustable low-pass crossover capable of delivering 120W of continuous power. A remote bass level control is provided so you can adjust the bass level any time you like and it accepts both RCA and speaker level connections. An auto-sensing feature means if a remote-on lead is not available at the time of installation you don’t have to worry as it will power on and off by itself! In today’s vehicles where finding a +12V switched wire can be tricky to find this is an added plus. If you don’t need booming bass but want to add good low-end sound to your system and space is at a premium the PWE-S8 is a great choice. Head over and check out the happy buyers and current price at Amazon. 4. 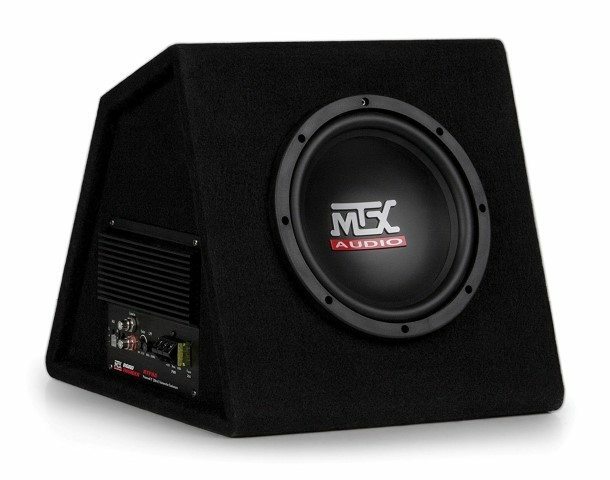 MTX AUDIO RTP8A 8″ 120W Vented – Affordable but well-built. Great sound. Measuring height 13″, width 13″, and depth 13.75″, the RTP8A may be conveniently small, but don’t let the small size fool you. It features a true 120W amplifier matched with a great MTX subwoofer in a vented enclosure for great low-end bass extension. It sells near $150 typically. The side-mounted amplifier features easily accessible connection points and metal panel-mount RCA connectors along with easy fuse access too. RCA or speaker-level inputs are provided and like other similar models a remote External Bass Control (EBC) is provided. It’s rounded out by an adjustable amplifier gain and adjustable low-pass filter. A great sounding little subwoofer, and perfect for your truck cab, SUV cargo area, or car trunk. (I would recommend adding a protective grill). If you’re in the market for real bass sound you’ll love, be sure to read more details and find the current price at Amazon now. 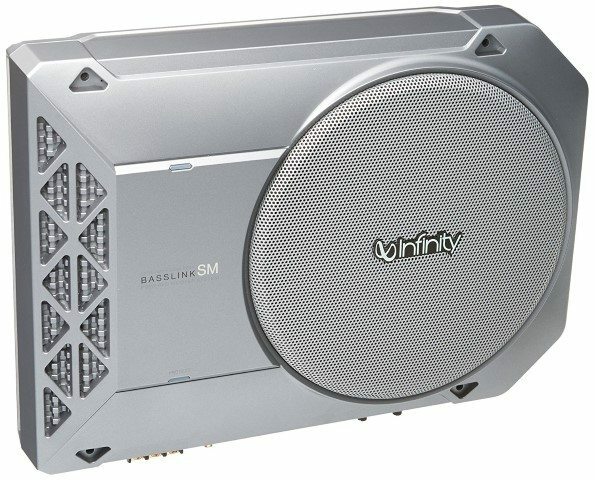 The Infinity BassLink SM is a more affordable but well-designed and reliable alternative to the Alpine PWE-S8, and is slightly larger but still a great fit for pickups and even under seats! It’s different in that it provides side-accessible controls and wiring connections rather than on the end like others. An 8″ driver is paired with the Class D amplifier for getting the most bass to compliment your music system without turning a great deal of it into heat like conventional amplifiers. The bass controls can be tailored to your liking (including boost) and the low-pass crossover is adjustable as well. It measures 7 x 17 x 14 inches. A remote level control is included as well. It can be used with both factory or aftermarket stereos. Definitely worth heading over to read more and find out why many people find it to be a great bass solution. Car powered subwoofers are great for many car audio systems – especially those where space is limited. They’re a great way to avoid having to completely replace a factory sound system. Buy a good quality model and if space allows buy the larger size option where possible. The most compact models provide bass “extension” that can complement a system and great sound for their size, but not the “thump” of larger subwoofers. It’s important to have realistic expectations before purchase. Don’t forget that you’ll need to purchase an amplifier installation wiring kit as well. I recommend a 10 gauge power wire size and one with RCA cables if you’re using an aftermarket stereo. You’ll save money rather than buying RCA cables separately. Avoid getting a crappy amp wiring kit! You can read my amp wiring kit guide to make a great choice. Feel free to comment below or contact me if I can be of any help.